Reading and share top 2 Damon Wayans Jr famous quotes and sayings. Browse top 2 most favorite famous quotes and sayings by Damon Wayans Jr.
1. "I was always the class clown and got kicked out of class at least once a day for just being a goofball. Not suspended or anything, just sit outside and look at the tree on the bench. I got benched a lot. 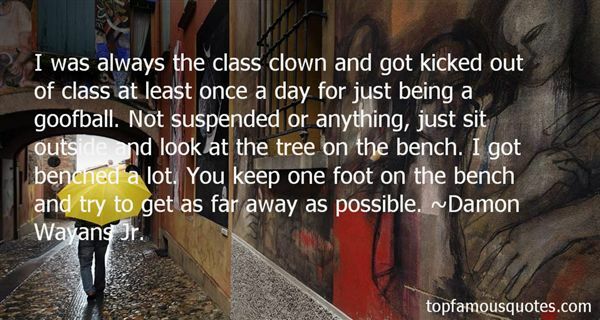 You keep one foot on the bench and try to get as far away as possible." ~ Damon Wayans Jr.
2. "Television is a thing that people get very familiar with. They want to hear your voice in their head." ~ Damon Wayans Jr.
Will: Have you ever seen what happens to someone with demon pox? First it lies dormant. One begins to turn yellow and green. Then the swelling sets in -Jem: THERE IS NO SUCH THING AS DEMON POX."